Fortunately, the early morning one and half hour Easyjet flight from Gatwick to Geneva was uneventful. The staff were really welcoming, attentive and created a great mood on board. I have to say the food is quite tasty on board Easyjet and quite reasonably priced considering we are a captive audience. The Club Med Sensations hotel is newly built into the mountainside of Val Thorens, boasting magnificent views over the Valley. The Trois Vallées Ski region is the largest in the world with over 600km of piste and the highest lift being 3200 metres high. Snow is pretty much guaranteed and offers extensive skiing to experienced and intermediate skiers. There are some nursery slopes for beginners, but these weren’t accessible from the hotel. When we arrived at the hotel, I immediately noticed we were all made to feel very welcome. The staff were extremely attentive and they seemed to be everywhere. The hotel is very light and airy, contemporary in design and is made up of four separate blocks built in a way to gain maximum benefit from the mountain panorama. It has a glass atrium and a brightly coloured interior, including a huge climbing wall for all guests to conquer. 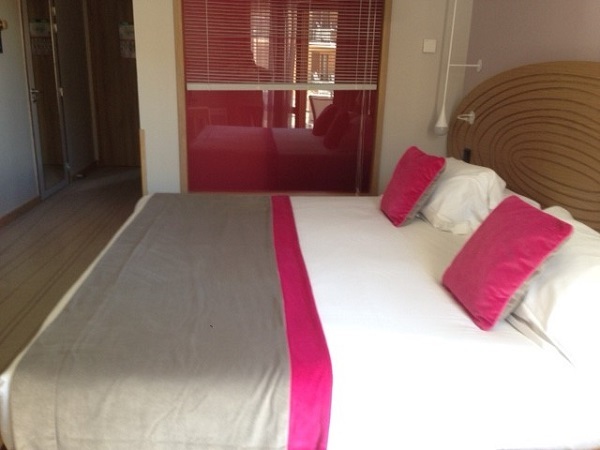 The bedrooms are stunning - very spacious with a balcony offering magnificent views over the ski area. There’s everything you would expect from a good 4-star hotel, including bottled water along with tea and coffee facilities. After an early morning departure from the UK, we were all ravenous, so our first port of call was the hotel buffet restaurant. I was overwhelmed with the choice of food stations on offer. Everything is freshly prepared in front of you with a mouth-watering selection of starters, salad bar options, cheeses, artisan bread, freshly grilled fish, succulent burgers and steaks, pasta, pizza, soups, stews, desserts and 12 different types of ice-creams and sorbets. The choice is endless and the quality is as good as any five-star cruise I have experienced. You can even help yourself to draught beers or soft drinks and there is always wine on the table. There are three terraces which face towards the sun and where you can enjoy your lunch and a drink whilst exchanging ski stories. Eating out on the terrace in the bright sunshine whilst enjoying a beer was simply the best. The entertainment at the hotel is extensive - Club Med are renowned for their lively and fun 'theme' nights, which, for us, consisted of 'neon night' where we had to paint our faces with neon paint and wear fluorescent clothing. The entertainment lounge is a very lively area and there were podiums to dance on with the Club Med entertainment team - guess who was on those all evening. During the day, non-skiers (though there are very few of those in Val Thorens) can enjoy other activities as part of the hotel’s entertainment programme, including cooking. Activities are displayed on monitors dotted around the hotel, so you never miss anything that is going on. Ski or snowboarding lessons run by the professional ESF instructors. Or, for experienced skiers, there is ski-guiding available. Non-ski activities such as bobsleighing, snowshoeing, cross country skiing, yoga, fitness classes and weight training. 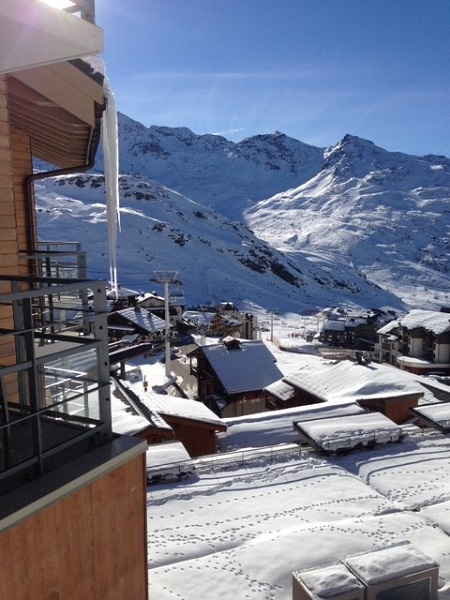 The extensive skiing which Val Thorens offers is obviously the main highlight. There really is nothing more exhilarating than whizzing down a mountain as fast as you can - but in control. Being able to ski straight out of the hotel's front door was another major plus. The other agents were very experienced skiers, so I had to keep up or I would have been lost on a mountain all alone. It really was a fantastic opportunity for me to improve my skiing from intermediate to advanced. The well-rehearsed and lively entertainment also stands out as a highlight. The hotel was quite quiet as it was low season when I was there, but I would envisage in high season that the queues for food could be quite long. This can't really be improved upon, but it’s important to be aware that you may need to wait for hot food to be prepared. Buffet style restaurants take a day or two to get used to. Once you've been there a little while, though, you can learn some tricks to ensure you choose the right food at the right time. More staff required on the bar, they were rushed off their feet to meet demands. I would recommend a holiday like this 100%. Club Med offers premium all-inclusive ski holidays, meaning the only thing you have to pay for in the resort is your ski equipment. This allows many people who go with Club Med to take their own ski gear. The organisation is fantastic and your lift passes are ready for you upon check-in, so no time is wasted and you can get straight on the slopes. At the beginning of the season, Club Med buy brand new skis and boots so you can be sure to have the latest and most technologically advanced equipment. I was the first person to use my brand new hired skis and they were fast. Club Med is great for different generations too, as there is always something to do for all ages. If you are looking for a premium all-inclusive ski holiday, I would always recommend Club Med. Pricing does seem high at first glance, but when you consider everything that is included, it’s definitely worth it. Always look out for low season or end of season deals, they are incredible value. Knowing what is included and having had the experience, I will not hesitate to book my next ski holiday with Club Med. I have skied for many years and always 'slummed' it in self-catering accommodation, thinking that I was getting a good deal, but not anymore. It’s Club Med for me, all the way. If you would like us to help you plan your own skiing holiday or an all-inclusive trip elsewhere, we’d love to share our knowledge and advice with you. Visit your local Fred. Olsen Travel Agents in Ipswich, Norwich, Colchester or any of our other location in East Anglia and along the south coast. We also currently have the chance to win a holiday with Club Med. Enter through our website but you may need to pick up a copy of our free magazine ‘escape’ in order to answer the question.